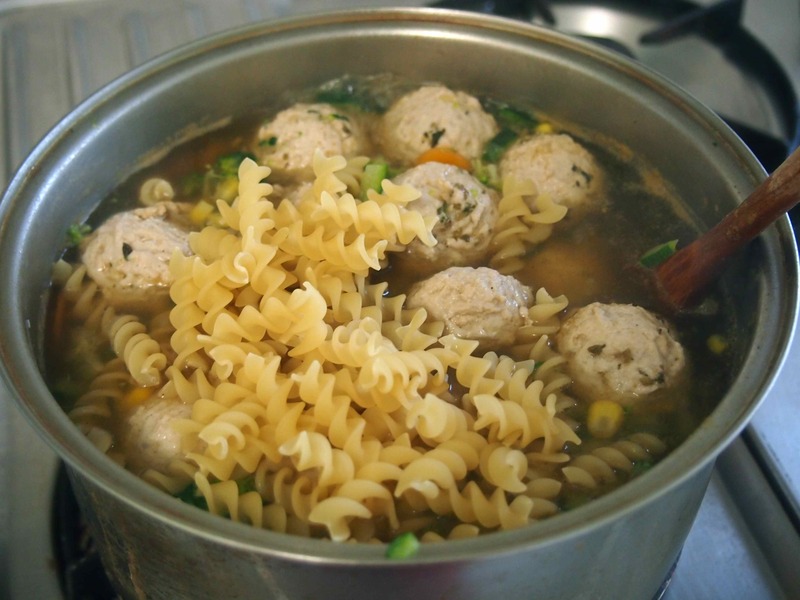 I came across a recipe for meatballs in vegetable soup. This recipe is so healthy (not just by my normal standards but by those who actually have healthy eating standards), and tastes soo good – it has already made it into the dinner rotation. One of the things I really like about this recipe is that you can throw any vegetables sitting in your veggie crisper into it. There are only a few key ingredients that you must have – besides that, it is whatever you have on hand or feel like. Cauliflower, beans, chickpeas, peas, or any other vegetables that you have in your veggie crisper, or cans in your pantry. If you are particularly fatigued or in a rush, you can just chuck in a bag of frozen vegetables, although I prefer to use fresh vegetables for two reasons. Firstly, I know what is in it (and it most definitely does not have anything that I have a food intolerance to) and secondly, I think that fresh vegetables just taste better. Step 1: Prepare all of the vegetables (chop them) and set them aside. Step 2: Place the chicken mince or pork mince on a table and sprinkle the oregano evenly across it. 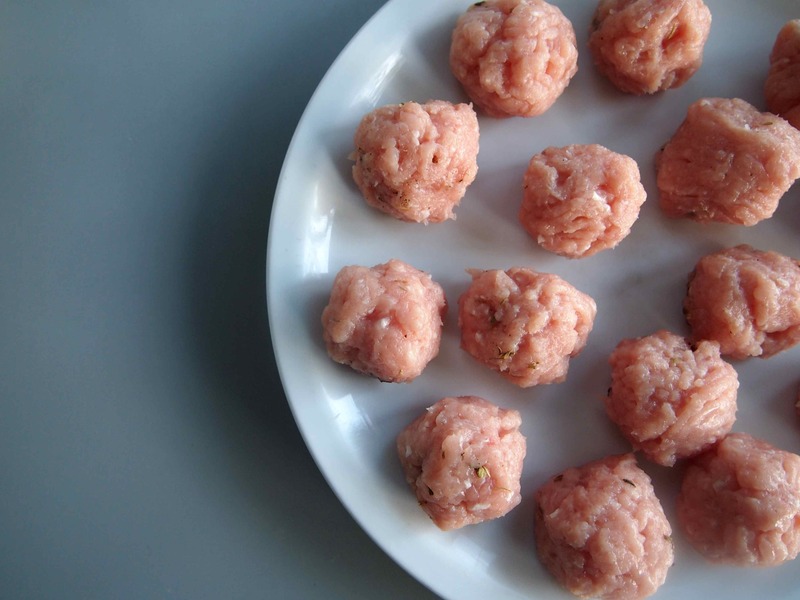 Decide how many meatballs you want and divide the mince into that many portions (evenly). I divided it into fifteen meatballs (five rows of three). Step 3: One at a time, grab each section of the divided mince in your hand and roll it around so that the oregano is spread throughout the ball – make sure it is a tight ball. Place each ball on a plate and set aside. Once all the mince balls are set aside sprinkle a touch of salt and pepper across all of them. Step 4: Place a large pot on a high heat and fill it with stock (or water and stock cubes) and all of your prepared vegetables. Bring it to a boil. Step 5: Once the soup is at a boil, gently place in the meatballs (careful not to splash yourself with the boiling water). Bring the soup back to a boil. Add in the salt and pepper. Step 6: Once the soup has returned to a boil, lower the heat to a simmer and cook for another eight minutes. Step 7: Add pasta and cook the soup for a further three minutes or until the pasta is cooked. *Note if you are cooking gluten free pasta or pasta that requires longer cooking then add it earlier than this point in time. Step 8: Take the pot off the heat and add in the baby spinach (this will stop the leaves from wilting too much). *Note, make sure the pasta is cooked prior to taking the pot off of the heat. Step 9: Taste test the soup and season with salt and pepper to your liking. Step 10: Dish up and enjoy! This soup really is a massive time saver of a meal to cook and is very healthy. It stores in the fridge well and you make the entire recipe in one pot which is fantastic for cleaning up purposes. I would definitely eat this soup hot. I have always eaten it with a piece of bread or toast. This meal can be eaten in the summer or winter – it isn’t winter here right now, but i’m loving it so I know i’ll love it in winter when it can warm me up! I can’t offer any information about freezing this soup as I have always finished it and have had no need to freeze it. If anyone does do this please let me know how it goes! Remember, anyone who uses gluten free pasta if you are storing the soup in the fridge overnight the pasta will continue to soak up the soup so when you go to eat the soup the next day there will be a high ratio of veggies to liquid in the soup. I hope you enjoy it 🙂 ! Fantastic! I really do like the recipe :). Thanks for letting me know the recipe freezes great and the tip about the stock and veggies! This reminds me of a soup my dad makes from time to time with beef bones, cabbage, carrots, potatoes, leeks, and green beans. I love how the veggies make the broth taste so sweet. Looks yummy! I’m so glad the soup reminds you of a family one! I hadn’t thought of putting potatoes in this. The soup is so yum! Soups are a great idea for using odds and ends of good food! I grow a lot of veggies and they all find their way into soups, pasta sauces, and bean burgers. I don’t have a real recipe for any of these, just add things until it tastes good. I’m impressed that you have your own veggie patch! Sounds like you’re a great cook if you can throw pieces together without a recipe and end up with something that tastes great :). Thank you! I try to make my directions as simple and informative as possible to cover any side thought you might have when cooking. This soup is so tasty it is worth the tummy grumbling :). Healthy. One pot. Lots of opportunity for veggies. That’s my kind of dinner! And great job with the appealing photos and thorough instructions! I know it is great isn’t it! You can just chuck in any veggies that you have lying around and so nice and easy to clean up. I actually just had this for dinner tonight! I’m so glad that the instructions are helpful :). Love double batches, love one pot meals, love soups, love ways to use up the old veg. This sounds delicious, and it’s totally going on my list of recipes to try. Thank you! This is another good one – you’ve summed up all the things I love about it although the other thing I like is how insanely simple it is. I hope you enjoy it as much as you have loved the ‘Cinnamon Nut Granola’ :).